Say hello to my dream meal. 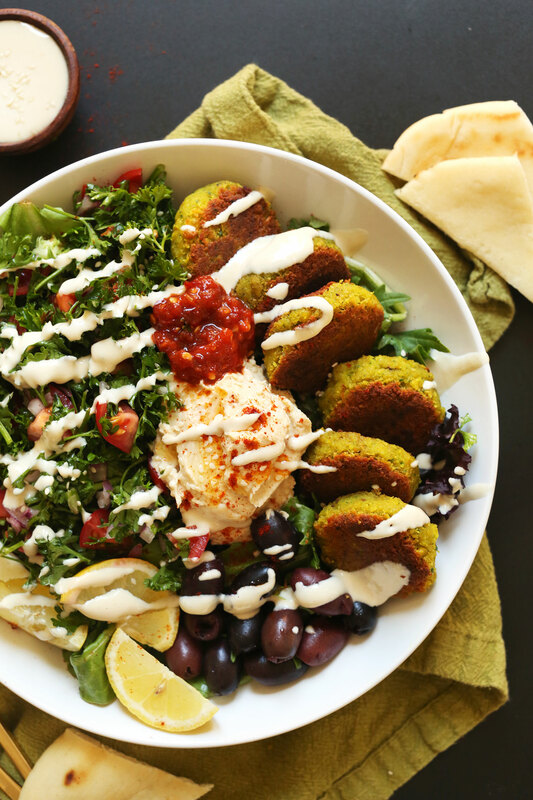 A bowl full of greens, veggies, olives, hummus, falafel, and tahini sauce. Swoon. I’m convinced I could eat this every day for the rest of my life and never tire of it. Who’s with me!? The base of this bowl is my go-to parsley, tomato, and onion salad with a simple dressing of lemon juice, olive oil, and sea salt. It takes 5 minutes and I make it at least once a week for falafel night. Yes, we have falafel night and it’s the highlight of my week. Don’t judge. Speaking of falafel, this is my favorite recipe at the moment. It’s absolutely perfect in texture and flavor, and comes together faster than most traditional falafel thanks to a quick-soak bean method! Shortcuts for the win. 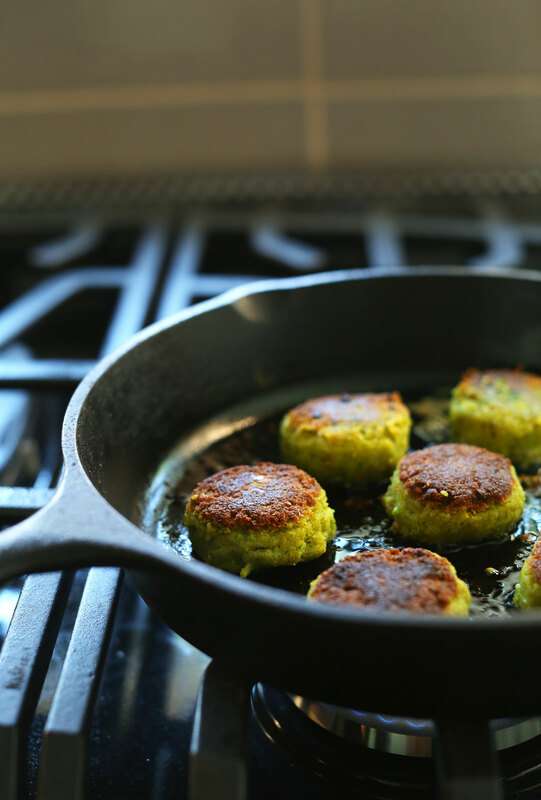 To keep this bowl a 30-minute recipe, I make these falafel ahead of time and pan-fry them as needed! Best life hack ever, and I always have falafel ready to go when I need them. This is the perfect meal when you’re craving something vegetable-packed with some serious staying power. One bowl (of 2) boasts more than 25 grams of protein and 22 grams of fiber! Now that’s a lot of plant power. If you try this recipe let us know! We love seeing your comments, ratings and your photos tagged #minimalistbaker on Instagram. Cheers, friends! 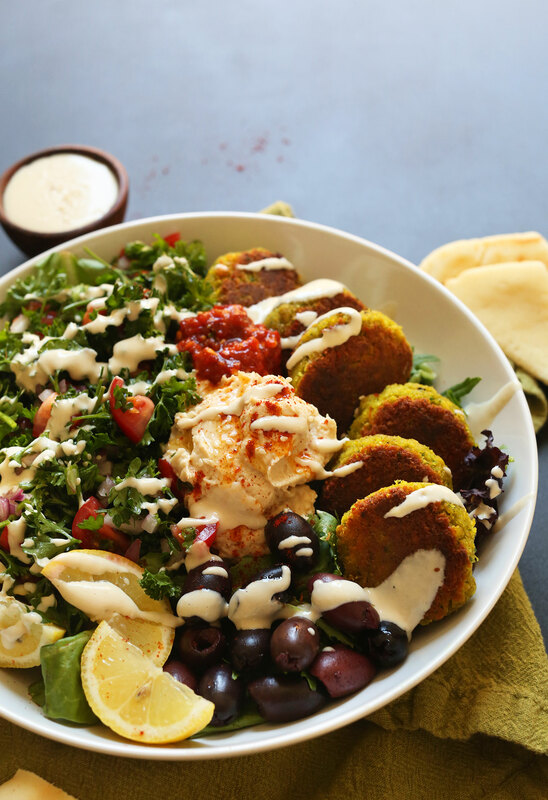 The ultimate Mediterranean Bowl with greens, hummus, olives, parsley-tomato salad, classic vegan falafel, and a variety of sauces! My go-to easy recipe when we're craving Mediterranean cuisine! First prepare falafel by following this recipe. You will only need 12 falafel, which is about half of the recipe (amount as original recipe is written // adjust if altering batch size). I like to make a batch ahead of time and keep them uncooked in my freezer so I just have to slightly thaw and pan-fry them when I want a Mediterranean Bowl! This keeps prep/cook time under 30 minutes. Prepare the parsley salad by adding parsley, tomato, onion, lemon juice, salt and olive oil (optional) to a medium mixing bowl and tossing to combine. Set aside. 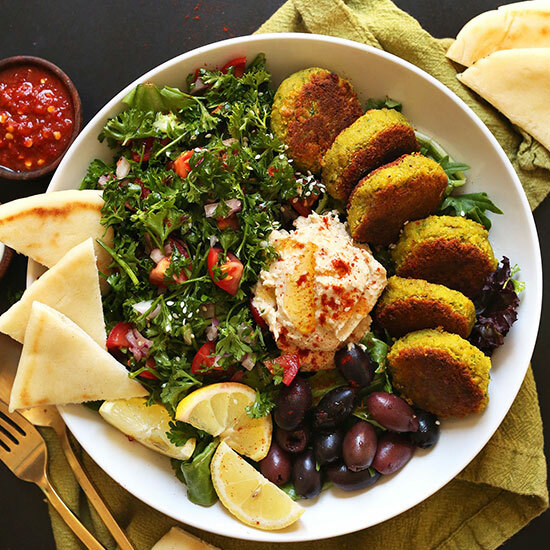 To serve, divide salad greens and parsley salad between two (amount as original recipe is written // adjust if altering batch size) serving bowls and top with hummus, olives, 6 falafel each and tahini sauce. I also prefer some fresh lemon juice and chili garlic sauce. *If you don’t have time to make falafel, sub raw chickpeas or my Shawarma Chickpeas. *Nutrition information is a rough estimate calculated with tahini sauce, 6 falafel per serving, and without chili garlic sauce or garlic dill sauce. I’ve made this twice and love it. I like to add some mint and garlic to the parsley salad but it’s also very tasty as is. Hi. I love falafel and look forward to trying your recipe. You mentioned you make some ahead of time or always have some ready to fry up. Do you freeze them or make a big batch a d just keep in fridge for maybe a week? Hi Martha! You can make a batch ahead of time and keep them uncooked in your freezer so you just have to slightly thaw and pan-fry them when you want a Mediterranean Bowl! This keeps prep/cook time under 30 minutes. I made this and it didn’t quite turn out well! The used 3/4th the parsley quantity for the salad and even then it was too much/ too overpowering. Sorry to hear this recipe didn’t do it for you, Sam! Better luck next time! So I was going to take a photo but we ate it all before I remembered! This was delicious! I made roasted chickpeas instead of falalfel because I was lazy and also thought it would be healthier since it’s not fried. Also mixed in some leaf lettuce because my husband didn’t want all parsley but he loved the parsley in the end. The dressing was delicious! Will definitely make this again and again! The best meals are the ones that are so delicious, you forget to photograph them ;) Thanks for sharing your recipe changes, Anne! We are glad you both enjoyed it! Do I have to use all three of the sauces? Or can I choose between the three sauces? Hi Wim! No no, feel free to make any of them but not all three! Hi Dana. Just a technical feedback (the recipe looks fantastic and i will try it very soon! ), is that when i input in the serving box anything else than the original recipe amount, the amount of grams in the Parenthesis isn’t adapting itself :-) is there a way to fix that? thanks a lot for all the lovely help! Hi Liat! We’re in the process of switching over our recipe plug in and we haven’t had time to amend this one yet for adjustable metrics. But it should be done soon! Sorry for any inconvenience in the meantime. Absolutely gorgeous. I doubled everything to make 4 portions and cooked up 160g bulgur wheat to add some body to the salad and make it more substantial. Would eat it every night if I could. Can’t wait to eat the leftovers tomorrow! I made this using the “Better than restaurant falafel” recipe also from this blog and it was great. In addition to the suggested toppings I added some radishes. Great healthy meal, I’ll be making this again. Thanks! 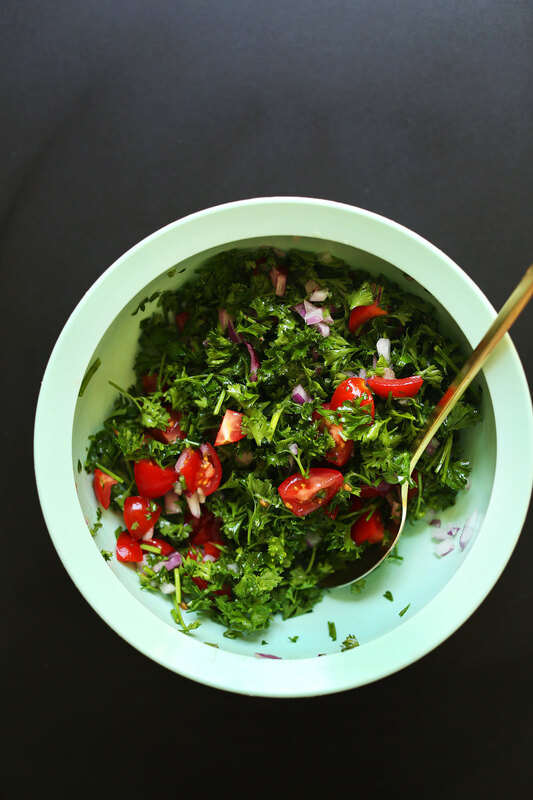 This is tabbouleh, not your simple green salad. And falafel is always vegan. This was super yummy. I added cucumber and a bit of cooked quinoa to the salad, makes mklinux it more like tabbouli. Also used one of your other falafel recipes and it came out delicious. Thanks! I tried this recipe this weekend (my first from your site) and I had a question on texture. I loved the seasoning on the falafel, but it was too mushy. Are there any tips as to have it be a tad more crispy/hard (like those found in restaurants) on the outside? so sad …. but congrats on your blog !! every thing you make looks delicious ! This is definitely a hearty bowl. To reduce calories add fewer falafel! I made the salad, falafel, and hummus and ate them together tonight and it was so easy and delicious and I feel great! Thanks!! Just wanted to thank you for all your recipes, they are all delicious and they are all great recipes – too often you get recipes that look great in pictures but don’t hold up when made, but yours always do. Thank you for all your efforts! You rock! Does your nutritional information contain the hummus/olives/pita? Thanks! Can you please make an ultimate Indian bowl or Thai bowl?? I think with your talent and creativity, you’d whip up something AMAZING!! Hi Dana! Long time follower here and I just wanted to say how much I love how you have separate categories in your ingredients list. It really helps my eyes stay on track and not searching all around while cooking. Thanks again for everything! I made it for dinner this week…There are not enough stars to show how delicious it tasted!! Perfection in a bowl ? This looks absolutely lush – like heaven in a bowl! Going to try to make this on the weekend! In my first weeks as a vegan 6 months ago, one of you falafel recipes made me realize “oh my goodness, I can do this!” It was the first amazing meal I made. I had never made falafel. I now love it in a box; I love it with a fox. Thank-you for helping me make this transition. 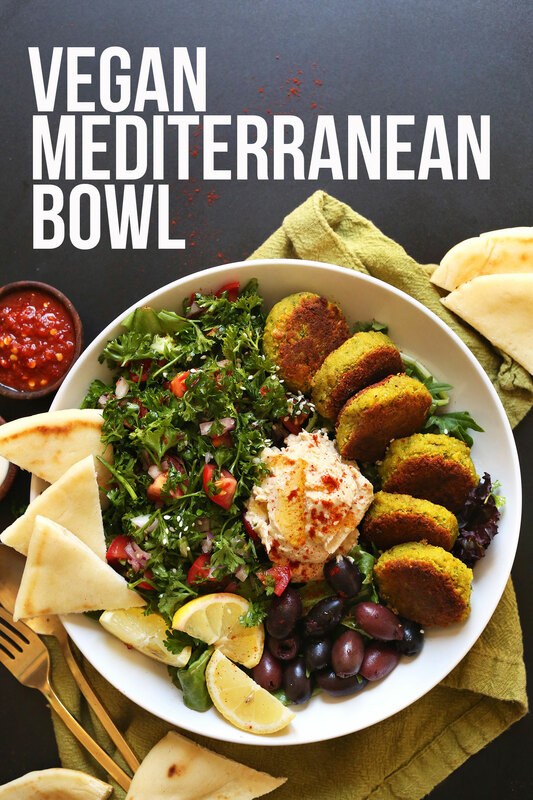 I can’t wait to make your Mediterranean bowl! Yum! This looks so delicious, and I love all of those colors! Also, that parsley salad looks like heaven! Oh god this looks like paradise…I am seriously coveting this bowl! it look soooo good I will try it for sure!! YUM! I cannot WAIT to try this one!! I am a huge fan of bowls, and I’m definitely going to try it with some roasted chickpeas. Thanks, Dana!! Looks amazing! As do all of your recipes. :) Do you use flat-leaf or curly-leaf parsley? Both work, but curly is best! I adore that the recipe consists of 6 falafels per person, not a sad two or three that you get at restaurants. You know how to live, lady! Thank you! Right?!! Hope you love it! So excited! Can’t wait to try this. Oh my, that is a heaven on a plate! This looks incredible, will definitely be trying this out! I have a feeling that this will be one of my go to meals ?